Staff at the LMB have raised £226.77 for Marie Curie as part of “The Great Daffodil Appeal”. 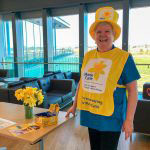 Freda Chapman, from the LMB’s Domestic Services team, led the collecting in her role as the “Face of East England” for Marie Curie’s campaign. On volunteering to collect for Marie Curie, Freda said, “I collect because I lost my mum, dad and two sisters. It’s great to give back. 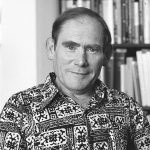 Sydney Brenner, Director of the LMB from 1979 to 1986 and 2002 Nobel Laureate, died on Friday 5th April 2019, aged 92. From the 1950s, Sydney was at the forefront of many developments in molecular biology, in particular in molecular genetics, including the unravelling of the genetic code, and the discovery of messenger RNA. He initiated the work on the nematode worm, Caenorhabditis elegans, to study how genes regulate organ development and how cells are programmed to die. 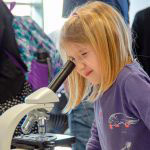 LMB scientists have been talking with members of the public and contributing to the 25th annual Cambridge Science Festival with family-friendly hands-on activities and a fascinating talk. Synthetic Biology: create a new protein! On the first Saturday of the Festival, LMB scientists gave visitors to the “Hands-on at the Guildhall” event the opportunity to design and create a new model protein using modelling clay and concepts from synthetic biology. 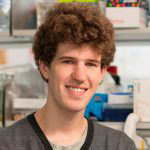 Benjamin Falcon, a postdoctoral researcher in Michel Goedert’s group in the LMB’s Neurobiology Division, has been awarded the inaugural Alzheimer’s Research UK Rising Star Award in recognition of his significant contribution to biomedical dementia research as an early career researcher. Benjamin has been studying the structures of filaments formed by the microtubule-associated protein tau with Michel Goedert and Sjors Scheres from the LMB’s Structural Studies Division. On International Women’s Day, the LMB releases the first in a series of group leader profiles written by science writer and LMB Alumna, Kathy Weston. 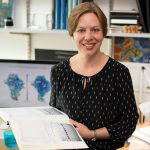 The subject for Kathy’s first profile is Lori Passmore, a group leader in the LMB’s Structural Studies Division. Pietro De Camilli will give the 2018 César Milstein Lecture on Tuesday 5th March at 4.00pm in the LMB’s Max Perutz Lecture Theatre. The title of the lecture is ‘Intracellular membrane contact sites, lipid dynamics and neurodegeneration’. The event is open to anyone in the local area who is interested in attending. 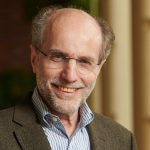 Pietro is currently the John Klingenstein Professor of Neuroscience and Professor of Cell Biology at Yale University School of Medicine. 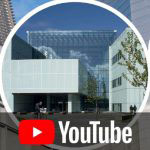 Did you know that the LMB has a YouTube channel where you can find out more about the work done here and about our researchers? Often science can be hard to understand when it’s just written as dense text. Animations that show the way molecules move and interact or interviews with the scientists who did the work can really help explain complex research. 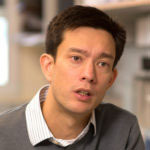 Jason Chin, joint Head of the LMB’s PNAC Division, has been awarded the 2019 Raymond and Beverly Sackler International Prize in the Physical Sciences. Jason shares the Prize with Professor Christopher J. Chang from the University of California, Berkeley, and Professor Matthew D. Disney from The Scripps Research Institute, Florida. 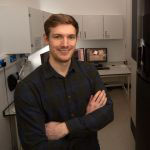 Max Wilkinson, a graduate student in Kiyoshi Nagai’s group in the LMB’s Structural Studies Division, has been announced as a winner of the 2019 RNA Society/Scaringe Graduate Student Awards. The RNA Society/Scaringe Awards recognise outstanding achievements by young investigators and aims to encourage the best and the brightest to continue contributing to the field of RNA science. Bob was born on 27th May 1932. 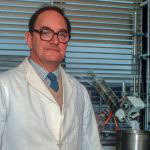 He received a BA in Natural Sciences (Class I) from the University of Cambridge and then a PhD on the ‘Studies in the degradation of peptides’ in 1957.